Spend more time with friends and family in the New Year by entertaining more often and more easily. Don’t focus on a formal event that takes time to plan and costs a lot of money. Think casual, and simply set aside 2 hours a month to catch up with people you don’t see often enough, or with those you’ve met but haven’t had the chance to see again. Try different teas, mineral waters, Spanish cheeses, single-origin chocolate bars—whatever you’d like to learn more about. The group will enjoy mixing and discovering new specialty foods; small groups are easier and less expensive to manage and guests mix more easily. Champagne). Photo courtesy Wisconsin Milk Marketing Board. Buying cheese for tonight? 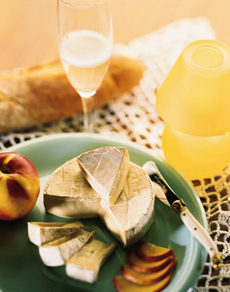 Double-crême and triple-crême cheeses like Brillat-Savarin, Brie, Camembert, Explorateur and Saint-André are the way to go with sparkling wines. Learn more in our Cheese Glossary.